and I wanted to do something special. So, to commemorate our 150th post-a-versary, I’ve decided to share a drink, a story, and a very special bar napikin. The first booze I ever tasted was Scotch. My old man let me try some of his Cutty Sark on the rocks at a Christmas party wen I was 12. It was a little strong for me at the time, but I knew when I was old enough to really start enjoying whiskey, Scotch would be it. I wasn’t wrong. When I was old enough to dig it, Scotch became my #1 choice.When I finally got my own joint and was able to built my first Tiki Bar, along with the rum and the Midori and the Kaluha sat a bottle of 12 year old Chivis. 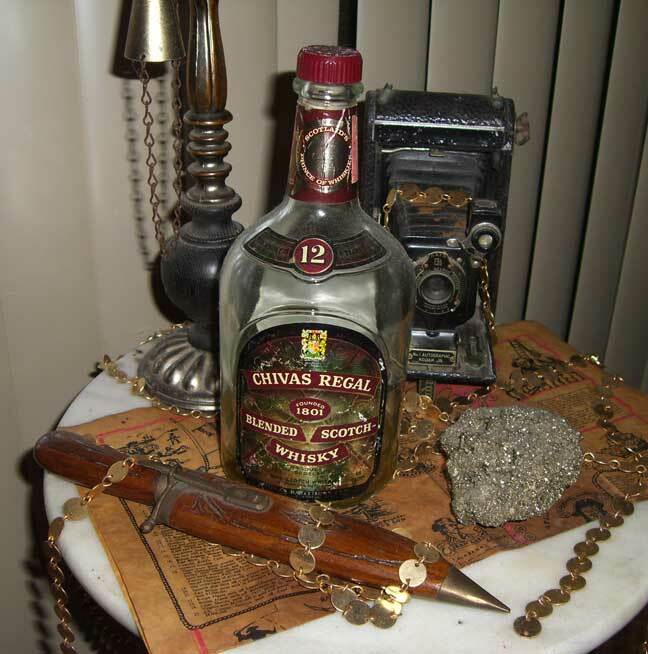 The first bottle of booze I ever bought at a liquor store was Chivas Regal. This particular bottle is from 1955. The Gold nugget next to it is a chunk of fool's gold my old man dug up in the Nevada desert in 1963. In 1991 I had the good fortune to see the Chairman of the Board himself perform at the Spectrum in Philly for his 75th Birthday Diamond Jubilee tour. Steve and Edie opened for him…and half way through his set, he said “I’d like to thank my two best friends for being with me tonight…Mr. Chivas and Mr. Regal.” He then took a drink of the 12 year old Scotch from a platform onstage, and continued the show. Chivas-Regal sponsored the tour…and got me to try their booze. Today, Chivas is in my top five favorites. If it’s good enough for Frank, it’s good enough for me. 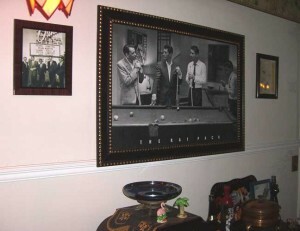 In 1963, before he met my mother and while he was still free enough to do his own thing, my father took a trip on a whim to see his cousins in California. 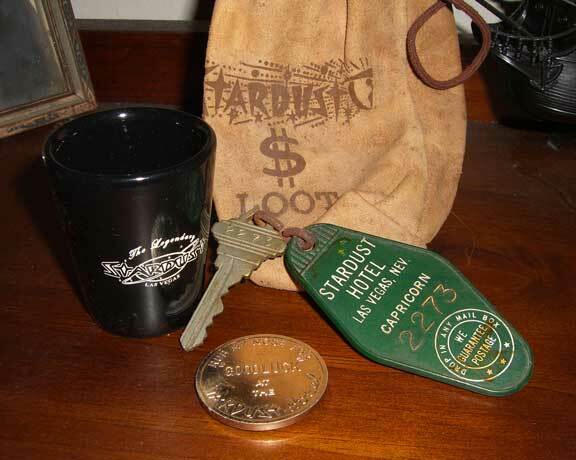 On the way he stopped in Vegas, and hit all the hot spots of the time…The Golden Nugget, The Sahara, and of course, the StarDust Hotel. He rented a Hertz and drove up to Tahoe, and made his way to the Cal-Neva Lodge, then owned by Frank Sinatra himself. He stayed a while, and continued on his trip to CA. 42 years later, a couple of years after his death, I was going through some of his photos and heirlooms. I found an envelope with a letter requesting a Hertz rental car in Nevada from 1963, and a folded up napkin with some blue smudges on it. I opened it up, and immediately recognized the smudge as the name “Ella Fitzgerald”. (That opened my head to a memory of him telling me he had met some celebrities in Vegas…but I was so young when he told me, I didn’t (yet) know who these people were. ) When I flipped this napkin over, imagine my surprise when I saw very clearly two more names…’Frank’, and ‘Dean’. 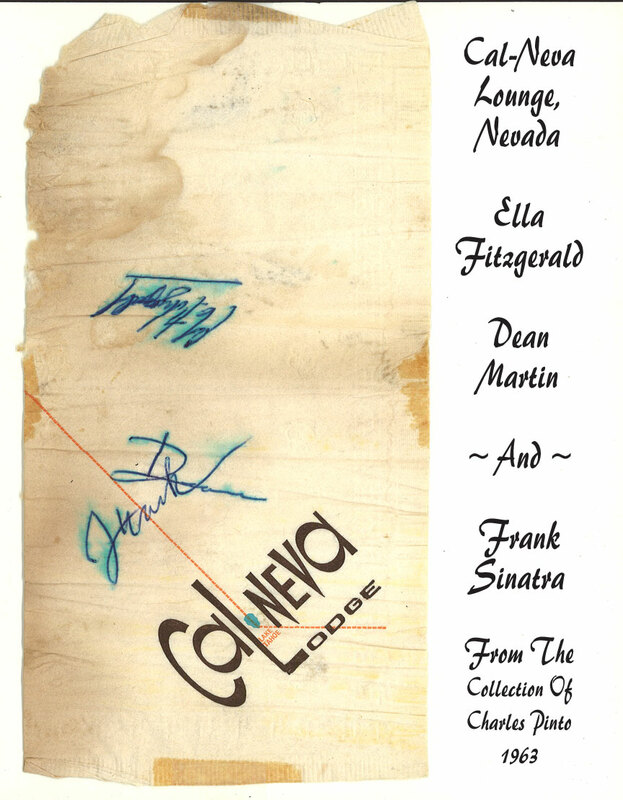 Call it dumb, call it funny, but it’s better than even money that these are the quickly scrawled sigs of Frank Sinatra and Dean Martin, scribbled while having a slug at the bar in Frank’s place, the Cal-Neva, probably after a show, along with the slightly nicer sig of Ella, who was probably sitting right there with them. I don’t have any way to authenticate this, and I’m not paying anyone to do it…for all I know my old man could have gotten the bartender to autograph the napkin as a joke, but I don’t think that’s the case. I think I’ve got a little magic here, a couple of autographs from a couple of guys who loved to entertain, and loved to hang out in the bar with their fans, have a drink, and share a few laughs in the days when celebrities could get away with it without being stalked. A very special napkin, from a very special person, who met some other very special people in his long and krazy life. So that’s post number 150. 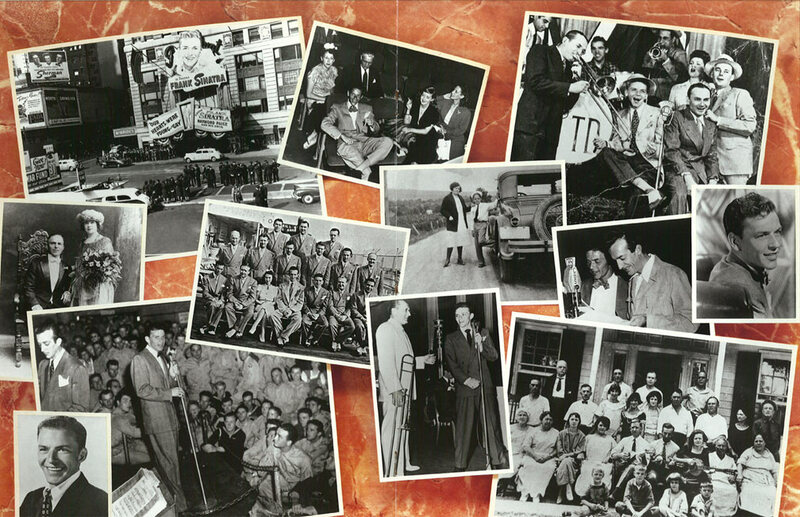 I couldn’t think of a better way to do it than with a drink at the Tiki Bar, an story from the past and a salute to the Chairman of the Board. Mahalos to all you kats & kittens for tuning in to Tiki Lounge Talk For 150 Posts!